It can be an exceptional challenge to construct waterproof showers, steam showers, and steam rooms so moisture will not penetrate into the building structure. Lack of proper moisture management can lead to significant property damage and mould growth in and around these wet living spaces. Unfortunately, misinformation and a misunderstanding of moisture management strategies has resulted in the use of products that will not perform as required in wet environments. For instance, there are builders who believe using a waterproof membrane 150 mm (6 in.) 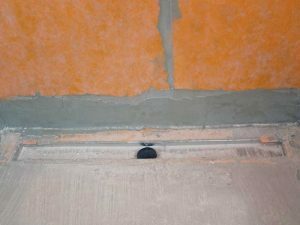 above the curb and installing tile with epoxy grout is sufficient to prevent water from penetrating into the walls. This installation method may work in the short term, but in a commercial shower or steam room it is a recipe for disaster. Understanding and following relevant standards is critical for successful installation. Covering the walls, floors, and ceiling with a waterproof membrane that meets American National Standards Institute (ANSI) A 118.10, Load-bearing, Bonded, Waterproof Membranes for Thin-set Ceramic Tile and Dimensions Stone Installation, and has a perm rating less than 1.0 using ASTM E 96, Standard Test Method for Water Vapour Transmission of Materials, is an appropriate solution for a successful long-term installation. Another alternative is to install a waterproof and vapour retardant polystyrene foam board system directly onto the studs, providing the system also meets the waterproofing and vapour requirements of ANSI A 118.10 and ASTM E 96. 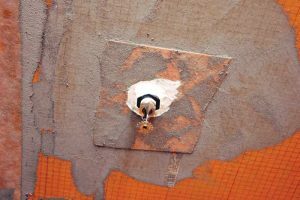 This article examines and explains waterproofing methods used in two projects in different parts of Canada. One is the renovation to the men’s and ladies’ steam rooms at Bankers Hall Club in Calgary. The other is the construction of 800 showers in the new Shangri-La residential tower in Toronto. The water vapour in a steam room can go anywhere. It forms potentially damaging water drops, so all protrusions were completely sealed with a waterproof membrane and silane-modified polymer base sealant. Bankers Hall Club is a 3252-m2 (35,000-sf) premier health club in the heart of downtown Calgary. The renovation project was a complete rebuild of a failed steam room installation in both the men’s and ladies’ locker rooms. Steam rooms are particularly challenging for architects, designers, and builders because of the presence of substantial amounts of water vapour for long periods.1 Systems that work well for waterproofing may not be adequate for vapour management because vapour particles are much smaller than even the smallest water drops. Steam rooms must be both waterproof and vapour-tight. The steam rooms at Bankers Hall had several issues related to water and vapour damage. Moisture had penetrated into the wall cavities and rusted out the steel studs and, in some cases, water had even migrated through the walls and into the hallways. Some evidence of efflorescence was also found. Efflorescence is a condition where the soluble salts of the mortar bed come through the grout joints, leaving an unsightly white powdery residue on the grout’s surface. These salts typically crystallize unless frequent cleaning and scrubbing is performed; in some cases, a chemical wash may be required to thoroughly clean the area. The problems with the original installation can be traced to the building materials used. 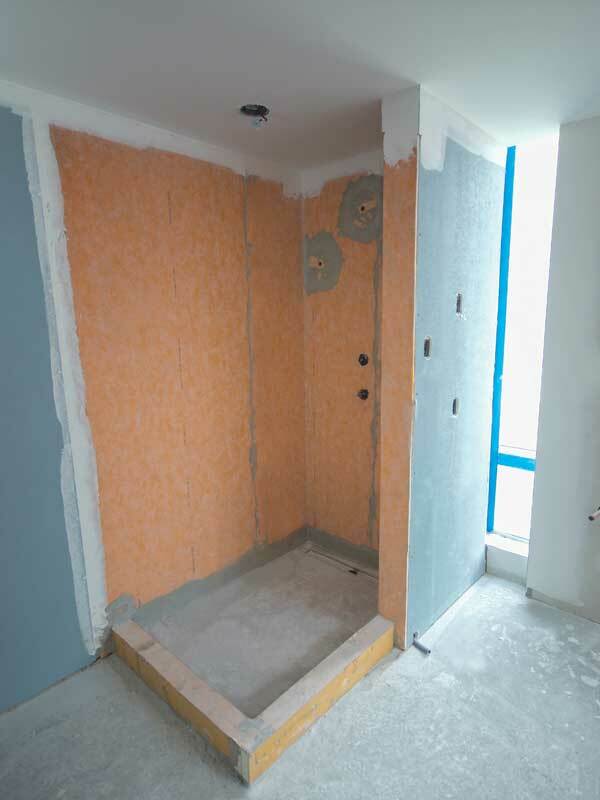 In the initial construction of the steam rooms, a coated glass mat backerboard had been employed on the ceiling and walls with a trowel-applied waterproofing membrane over top. The membrane was not a vapour retarder and could not withstand the high level of moisture in the steam rooms. As a result, the ceiling was literally caving in under the weight of the water that had soaked into and saturated the ceiling backerboard panels. Linear drains were located close to the shower wall, allowing for an uninterrupted tile field on the shower floor. Work to rebuild the men’s steam room started in September 2010 and took a little over a month for completion. Facility downtime was a concern, as it is with any commercial renovation project, so the steam rooms had to be done quickly, but still meticulously. They were completely gutted, with all material removed right back to the concrete block substrates. The walls were reconstructed, this time using the building panel system to permanently prevent moisture penetration. The new panels have an extruded polystyrene (XPS) foam core with a factory-applied reinforcing layer and fleece webbing on both sides. The panels are available in various thicknesses—for this steam room, 20-mm (0.75-in.) thick panels were spot-bonded to the block walls. The spot-bonding was done by putting dabs of thin-set mortar in 0.3-m (1-ft) intervals on the boards. Each board was then pressed onto the block wall and plumbed using a level. The same panel thickness was also used to cover the benches in the steam rooms. These panels allow tile to be bonded directly with a dry-set mortar meeting ANSI A 118.1. They also act as an insulator with an approximate R-value of 4 per inch (RSI 0.7), which is ideal to keep heat in the rooms and it allows for quick reaction time when the steam generators are turned on. Some sound attenuation was also gained using this type of panel so sound in the steam room is now more subdued than it had been originally. Another challenge with this project was the goal of keeping the existing drains in place. Complete removal and replacement would have been time-consuming and expensive. This goal was met by taking out the upper section of the two-stage drain, attaching an adapter ring to the existing drain, and then using an integrated bonding flange drain on top. This assembly allows for a sheet-applied waterproof membrane/vapour retarder to be applied directly onto the bonding flange of the drain. Shower areas were made completely waterproof before the tile installation was started. The floor was rebuilt with appropriate slope by using a traditional mortar-bed installation, which was waterproofed with the same membrane used to flash to the wall panels and cover all seams of the panels and protrusions. In addition to the sheet membrane, a silane-modified polymer base sealant sealed pipe protrusions, sprinkler heads, and other openings where moisture might penetrate. The use of these panels reduced the need for additional waterproofing measures and was instrumental in speeding up total construction time. If traditional backerboard materials had been used, they would typically need a waterproofing system applied to the entire surface before tile installation, or a vapour retarder such as 0.15-mm (6-mil) polyethylene would need to be hung before the board was installed. The Shangri-La Hotel and Residences in Toronto is a luxury high-rise tower being developed by Westbank and Peterson Group. The new construction project is similar to the Bankers Hall renovation because of the owners’ desire to have completely waterproof shower areas built under a tight construction timetable. The tower has 66 floors, the top 49 of which are for luxury private residences. The demanding construction schedule for the building requires more than 750 showers be built in just over nine months. The design calls for linear drains to be used in all showers. The drains are to be placed at the end of the shower floor adjacent to the wall with the showerhead. Drain sizes used in the showers include lengths ranging from 600 to 1200 mm (24 to 48 in.). The use of these drains allows the shower floors to be built using a single slope, a much different design than the intersecting slopes of traditional shower floors. A single slope on the shower floor allows large format tile and stone to be installed on the floor, something impossible (or at least exceptionally difficult) on a traditional multiple-slope floor. Tub decks were clad in glass mat backerboard and waterproofed with a sheet-applied bonded membrane. The same building panels used for walls and benches in Bankers Hall are being used to make the single-slope floor in the Shangri-La showers. 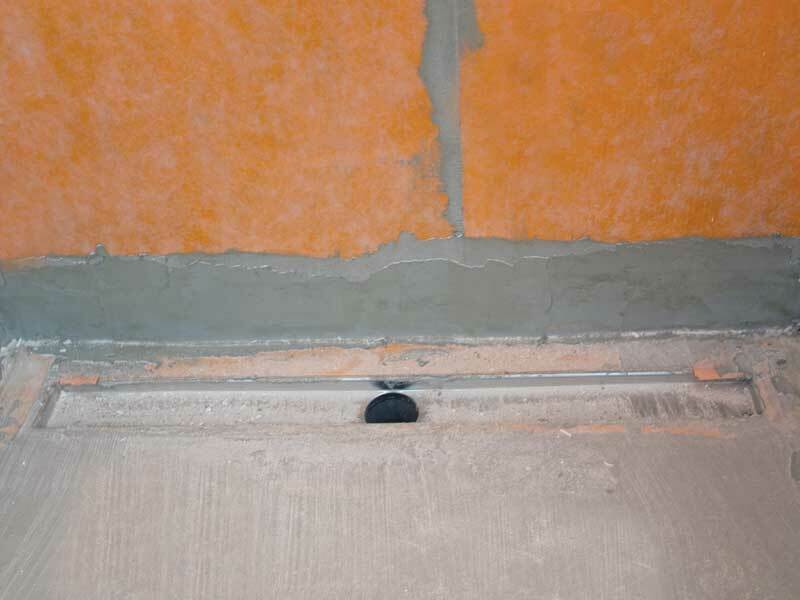 Employing waterproof building panels on the floor significantly reduces installation time. Traditionally, the shower floors would be built with a sloped mortar bed—a much more labour-intensive process that requires at least 24 hours of curing time before it can be walked on and waterproofed with an ANSI A 118.10 membrane. The building panel floor, on the other hand, is ready to be tiled immediately. Additionally, weight considerations are virtually eliminated as a traditional mortar bed at 50 mm (2 in.) can weigh as much as 122 kg/m2 (25 lb/sf). The waterproof building panels are extremely lightweight. The 20-mm (0.75-in.) thick panel used for the floor weighs about 1.8 kg (4 lb) for a 625 x 2440-mm (24.5 x 96-in.) sheet. 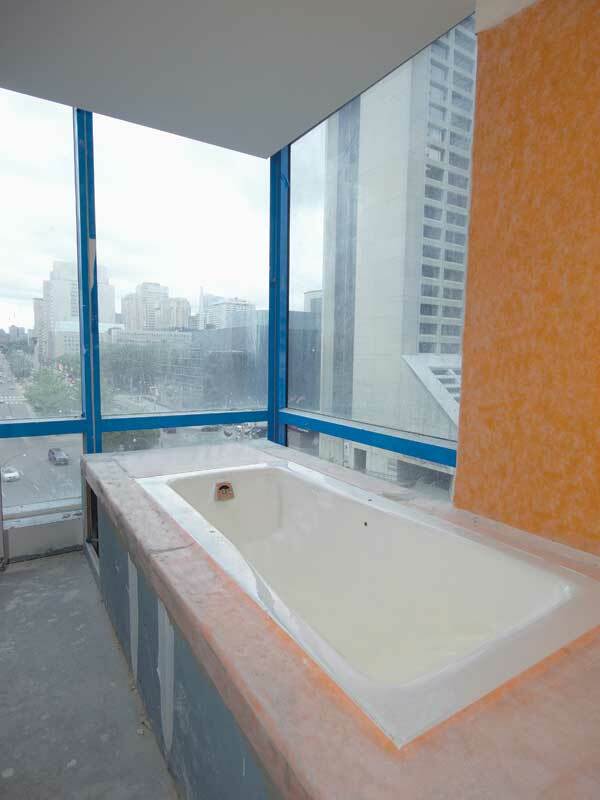 Shower walls and tub decks at the Shangri-La are being constructed of 15-mm (0.6-in.) thick glass mat backerboard, covered with the appropriate sheet-applied bonded waterproof membrane that is also a true vapour retarder with a rating of 0.75 perms. The shower design called for 89-mm (3.5-in.) curbs—a non-standard size smaller than a typical curb. To speed up and simplify construction of these unique curbs, they are also being made from waterproof building panels. Panels are cut and glued together to the desired thickness and height, a significant departure from traditional wood frame construction. By eliminating wood from this element, the builders have also eliminated the potential for future deterioration, rot, or twisting of the construction materials. The panels are completely stable and will not change over time. The goals of the Bankers Hall project were achieved, and the Shangri-La is progressing on schedule. In both cases, the work has taken less time than this type of project would normally require. The new showers are clean, attractive, and will be easy to maintain. The tiles provide a durable, hygienic, and decorative covering consistent with the upscale image of both locations. However, it is the structure underneath that will make these showers long-lasting and economical to maintain. Dale Kempster, CSC, CTC, TTMAC, is the technical director of Schluter-Systems (Canada), and has been with the company for 24 years. He is currently vice-president of the Materials, Methods, and Standards Association (MMSA) in the United States, and is on the Terrazzo, Tile, and Marble Association of Canada’s (TTMAC’s) board of directors. Kempster co-chairs the Specifications and Technical Research Committee and is chair of the TTMAC 09 30 00 Tile Installation Manual. He is the current chair of the Canadian Advisory Committee for the International Organization for Standarization (ISO [TC189]). Kempster also co-chairs the MMSA Sound-control Committee and served as co-chairperson of the MMSA Crack-isolation Committee. He is a graduate of the Certified Tile Consultants (CTC) program given by the Ceramic Tile Institute of America (CTIOA). Kempster can be reached via e-mail at dkempster@schluter.com.